Or at least in your eggs? 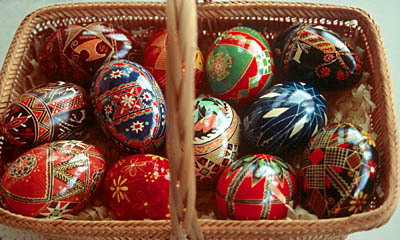 Carol Kostecki will demonstrate the wax-resist process of decorating Easter eggs known as pysanki on Saturday, February 7th, from 1:00-3:00 p.m. at the National Heritage Museum in Lexington, Massachusetts. This tradition, associated with Ukrainian church communities, came to Kostecki by way of marriage despite her own French-Canadian, German, and Abenaki descent. She is featured in the exhibition, Keepers of Tradition. Free admission. Snow date: Sunday, February 8. Author Heritage8Posted on February 2, 2009 February 17, 2009 Categories CraftTags Artist demo, pysanki, Ukrainian and Polish decorated eggsLeave a comment on Ready for some color in your life? 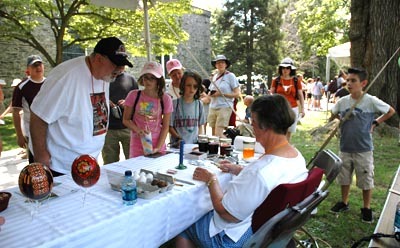 Massachusetts was well represented in the crafts area at this summer’s Lowell Folk Festival. Festival goers got to meet and ask questions of artists who demonstrated the making of weathervanes, duck decoys, Chinese calligraphy, hooked rugs, porcupine quill work, native twined baskets, Ukrainian decorated eggs, Cambodian ceramics, hand carved signs, Puerto Rican carved saints and carnival masks, wooden boatbuilding, ship’s wheels, tin men, and white ash baskets. The participating craftspeople are are just some of the artists featured in the exhibition, Keepers of Tradition: Art and Folk Heritage in Massachusetts, on view at the National Heritage Museum through February 8, 2009.